Since it's inception back in January 2014, 41 Starleague has provided us with many entertaining games. In the first season, we saw Modesty plow through the likes of Mong and Midas in the quarterfinals and semifinals dropping only one game before dismantling hero 4-0 in the finals to win first place. This second season has shown games that were just as entertaining with a wide variety of strategies implemented to achieve victory. With the RO8 set to start in the upcoming days, here's a quick look at how the RO16 groups fared to wet your appetite for more 41 SL action! 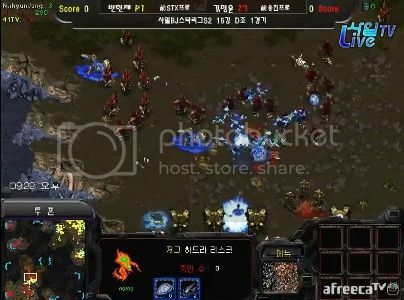 The first game took place between Killer and Jaehoon on FS ending when Jaehoon tried countering Killer's mutalisk harass by ramming 15-20 speedlots into his expansion which had 5 sunkens+2 lurkers for defense (pic). The second game saw hero go up against sSak in his worst matchup. After going mutalisks and grabbing a third, hero canceled that third for some unknown reason and tried to establish it in another corner. His third was barely up before he was attacked and eventually fell to sSak's MMT attack on his expansion. In the loser's match, hero went up against Jaehoon. In two games lasting less than 4 minutes each, Jaehoon proxy 2 gated not just once but twice determining that this was the best way to defeat hero at his best matchup. Unfortunately, hero defended against both of them easily dispatching Jaehoon in the shortest games that have been shown so far this season. With Jaehoon out, hero had to face Killer who's rocking 75% at ZvZ compared to his own 53%. Despite trying his best, Killer was too much for hero. His mutalisk micro was not only superior but his map sense especially in the second game was out of this world. Managing to gain an eco lead by trapping hero instead his base on HBR, Killer was able to eventually corner hero's mutalisks killing and injuring several in their attempt to escape. After more mutalisks were caught by Killer, hero had to gg realizing that he couldn't compete. Overall, these results weren't surprising. 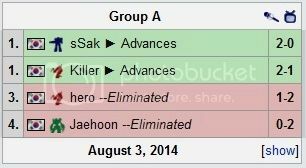 Both Killer and sSak are exceptional players and it's unfortunate that both hero and Jaehoon ended up in their group. Killer's game did seem off though that could just be sSak dialing things up a notch in TvZ. First game saw a failed proxy gate from Pure against Hiya. The dt followup also failed since Hiya was prepared with mines and a turret that finished on time. Pure ended up gging sending Hiya to the winner's match. In the second game, HoGiL went up against Sky. In a rather weird game, HoGiL allowed Sky to kill his third with a speedlot squad while concentrating on hydra production. Both players try to bust each other several times to no avail. Sky eventually mined out after constantly being denied a third while HoGiL lost his own several times. HoGiL ended up taking the game after his hydra attack manages to take down Sky's remaining army and workers. In the first game of winner's match, pure zerglings from three hatcheries were enough to take down Hiya's cc first build. The second game saw Hiya go double port wraith while HoGiL went for mutalisks/scourage. In a tense air battle lasting several minutes and almost cost Hiya one of his starports, Hiya emerged victorious and grabbed his expansion. His counter attack saw him cut down HoGiL's army considerably though he wasn't able to down down HoGiL's third. HoGiL retaliated with his own hydra/lurker/mutalisk army but didn't do much damage. Moving out with his army, Hiya managed to outmaneuver HoGiL, take out his third and gain a good position outside his expansion. HoGiL's army retreated after taking down Hiya's expansion however Hiya had the advantage, the better army and rode it to victory. The third game on FS was a different beast than the first two. Both players played the macro game though Hiya had the advantage early on. Pressuring the expansion, HoGiL managed to get defilers out just in time to repel Hiya and slowly took control of the game. He prevented Hiya from taking down his third, got ultralisks and managed to keep Hiya on the run with small attacks on mining bases and drops. Hiya was outmultitasked into gg. The loser's match saw Sky and Pure battle it out to determine who gets to play Hiya. First game ended up being a macro game on Circuit Breaker. Sky pressured Pure and managed to take a base lead. Two armies clash, stream goes down and Sky looks to be in the lead. He engages some of Pure's remaining army and attacks the third causing Pure to gg. The second game saw Sky attempt an inbase gateway which Pure scouted and pulled probes for. This was followed up by countless pylon blocks and gas steals going as far as building a forge in the mineral field. In the meantime, Sky goes up to 4 gates (proxying 2 of them) and attacks Pure who decided to expand on 2 gates and has 3 cannons. 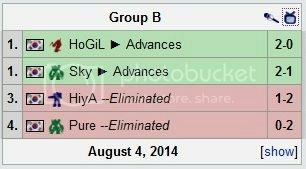 Pure gg and Sky moves on to face Hiya. Peruvians don't compare in skill or unorthodox strategies! The final match saw both Hiya and Sky trying to win to make their first RO8 debut in 41 Starleague. The first game resulted in Hiya going for two factories on Circuit Breaker after scouting Sky's 1 gate FE. Sky anticipated this and added a second gateway after the nexus. Though Sky was contained for a bit, he was eventually able to break out and establish his third as Hiya established his own expansion. At this point, Hiya went for an unorthodox strategy, biomech. The first engagement took place in the center of CB. Sky was repelled but not before showing his carriers. His 4th was taken down and Hiya marched towards his force with a stronger MnM force and 2 tanks. Despite his best efforts, Hiya lost all but several MnM units and up against several carriers and goons, he gg giving Sky the first game. Eyes aren't deceiving you, that's bio you see there! The second game was much shorter in comparison and showed Sky's affinity for unorthodox strategies on HBR. Going for a proxy gateway and pylon blocks, he kept Hiya on the ropes. Though Hiya managed to survive and get a bunker up at his expansion entrance, his tanks kept getting sniped by the goon followup off 2 gates. Sky's micro was also phenomenal and helped him close out this game to advance to the RO8. This group's overall results were a bit surprising. Sky's games were very impressive, not just from the strategies perspective but his micro seemed on a different level. On top of that, he was very patient and didn't make any major mistakes from my perspective. 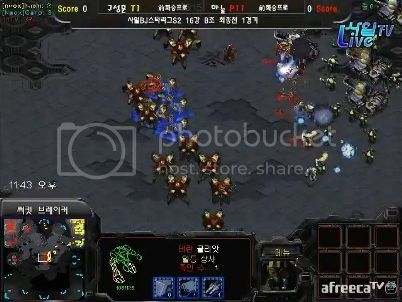 HoGiL is also performing really well and has taken down Hiya, Sky, Shuttle and other notable players since RO32. The first game between larva and lazy started off normally though a mistake on larva's part helped lazy gain a sizable advantage(lazy blocked ramp). After this, Larva went for his tried and true style of ZvP taking control of the game through countless zergling attacks and runbys similar to how he played Jangbi in SSL9. 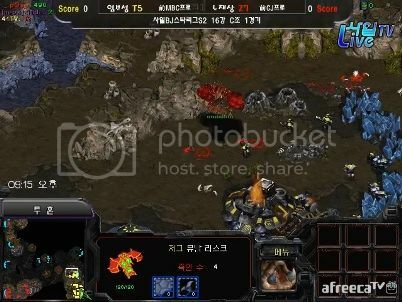 The game saw both players lose bases and workers before larva managed to close it out after finally taking down Lazy's third with mutalisks. The second game saw Sea go for a forward 8 rax against Cola. This ended up failing giving Cola an eco lead. After Sea got more rax, he pushed out again and managed to break the sunken defense and kill some drones before mutalisks were out. Unfortunately, this was also his undoing. With strong muta micro on Cola's part, Sea was forced to gg giving Cola the win. 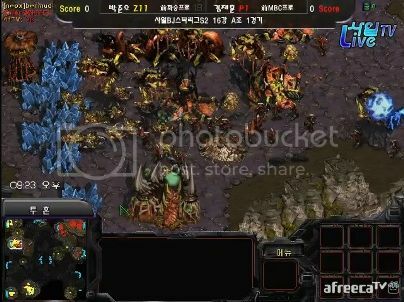 In the winner's match, Cola and Larva faced off in ZvZ on Circuit Breaker. Both players opted for hatch first and several zergling attacks took place. Both opted for mutalisks though Cola had the superior micro and mutalisk numbers managing to take the first game. The second game saw both players play a similar strategy of pool and gas before hatchery. The game saw some small skirmishes with zerglings. Cola with the larger zergling/similar muta force managed to take down Larva's expansion before retreating. Larva countered but didn't have enough to win the air battle causing him to gg and sending Cola to RO8. The first game of the loser's match saw Sea and Lazy clash in a TvP on Circuit Breaker. Sea went for a 2 fac build and tried to be aggressive. He eventually retreated to the high ground around Lazy's third, mined it up and continued expanding back home. Lazy countered with a reaver killing about 4-5 workers but retreated when goliath were out and eventually lost it. After some more macroing, Sea made quite the controversial move by moving out with a tank heavy army with no support. He ended up losing everything and giving Lazy the game. The second game showed that Sea can be as cheesy as Sky or Jaehoon by going for a bunker block on HBT (what is it with this map lol). Within 3:30 minutes, Sea won the game and tied the series 1-1 leading to game 3 on FS. Game three saw Lazy go for a reaver though he lost it trying to keep it from taking damage in Sea's base. Both players went into macro mode with minor skirmishes and some drops. Lazy eventually got arbiters and recalled to Sea's third as he established his fifth base. Seeing an opportunity, Sea struck Lazy's fifth base and managed to decimate a ton of Lazy's zealots due to them walking into 20+ tanks through a ramp. This shifted the game to Sea's advantage with Lazy gg'ing out after getting sandwiched by Sea's army later on. The final match took place between Sea and Larva. Sea's solid TvZ was more than Larva could handle as he went down 1-0 on Circuit Breaker despite his strong mutalisk micro. Their first game paled to their second game on HBT. Both players looked to be in a macro mode as they each took up to 4-5 bases each. Skirmishes took place all over the map as Sea tried to deny Larva's 4th and 5th base from mining. Larva looked to do the same with Sea's 6 o'clock. Using a positional advantage, Sea was eventually able to shut down some of Larva's mining (9 o'clock base), take the economic lead and micro his way to a 2-0 victory. The first game centered around Mini and ZerO battling it out on FS. Mini opted for sair/reaver against the hydra/lurker of ZerO. Mini kept going for reaver and dt drops throughout the game taking out drones, lots of hydras and gaining quite the lead. Eventually, he attacks ZerO's expansion and with storms/reavers, annihilates ZerO's army for the gg(pic). In the second game, both Mind vs Shuttle opted for a macro game grabbing 3 bases. A strong attack by Shuttle ended up wiping most of Mind's army and took down his third. Shuttle attacked after he started his fourth and ended up winning the game with the superior army. Storm/Reaver is a strong combo. In the winner's match game 1, both players opt for the goon/reaver combo adding in storms as the game went on. Mini defends Shuttle's earlier attack and with some back and forth action, Shuttle ends up beating Mini's army again taking the advantage and eventually attacking Mini's expansion and taking it down to take game 1. Game 2 on HBT had both players going for a similar starting strategy but diverted when Shuttle built two more gates to Mini's robo. With time not on his side, Shuttle ended up attacking into Mini's position shorter after the first reaver was out taking it out but suffering some heavy casualties. While putting on some pressure, Shuttle grabbed his expansion, macroed up another army and managed to snipe the shuttle right before the second engagement. Having both the eco advantage and now the army one, Shuttle attacked into Mini's base to win the second game. For the loser's match, both ZerO and Mind played against each other on Circuit Breaker. Mind was able to hit a 3 rax stim timing right before mutalisks were out and managed to take down ZerO's expansion. He kept up the pressure striking ZerO's 3rd and slowly transitioned to mech while grabbing his own third. After completely the mech transition, Mind eventually engaged ZerO at max supply and came out ahead to take the game. The second game was much shorter in comparison. Mind opted for a similar strat to Sea though he blocked the opening with a depot and placed a bunker behind. ZerO was going to have none of that so he gg'd out. Mech showing its good side. The final match in RO8 was between Mind and Mini. On CB, Mind went for a factory expand while Mini went for one base dark templars. With some early aggressive play, Mini was able to break into Mind's base but not before losing his army. Mind was ready for the followup dt attack and easily defends to take game 1. Game 2 saw unorthodox strategies from each player on HBT per usual for this map. After a gas steal and zealot attack was thwarted by Mind, he countered by blocking the main entrance with a depot to buy enough time for a bunker in turn taking out Mini's expansion. After Mini broke out, he countered and did some eco damage before retreating himself leading to macro game that Mini ended up taking with arbiter tech. Final game saw Mind try for a 4 vulture drop which did some serious eco damage. Both players took 3 bases with Mini opting for carriers. Mind was reading though with goliaths in his army and ended up just taking out Mini's expansion eventually winning the game and being the last RO8 entrant. A bit longer than I wanted but lots of exciting games that required it ^^ RO8 groups haven't been announced yet (it seems, could be wrong) so if there is interest, I'll see if I can write a small preview for the groups. Thank you for doing this, it looks awesome! There were some awesome games here, looking forward to Ro8. Korean language BW always makes me smile. Woo grats Sea and Mind!! Nice work, BigFan! Thanks for all the screencaps, concise writing, and recommended VODs! Can we look forward to more of these terrific battle reports for the later rounds and/or the BCTV Starleague? The commentator's enthusiasm doesn't do Game 1 between Mind and ZerO justice. For the most of time, he was just in awed of what's in front of him and lost his train of thought. Thanks BigFan, for uploading VODs and posting this recap. I thought the RO16 was really entertaining on the whole and I'm looking forward to the RO8! Well done! I enjoyed the writeup. Thanks for all the great comments and glad you guys enjoyed the recap RO16 had some great games and I'm hoping RO8 and so on will has just as good if not better games. Hiya's games in particular were great fun. Hopefully we see biomech work in the near future. RO8 groups have been released. Do you guys prefer I just edit them in or make another thread for a preview? Thanks for translation. I figured that maybe he had to leave somewhere but that explains it lol. Def make another thread for a preview, even if it's short. 2pac is always hungry for news.